These quick to prepare grilled tostadas make a refreshingly delicious main dish or appetizer, sans tortillas! In a medium bowl, toss the diced avocado with the lime juice and olive oil. Stir in the rest of the salsa ingredients. Season to taste and set aside. 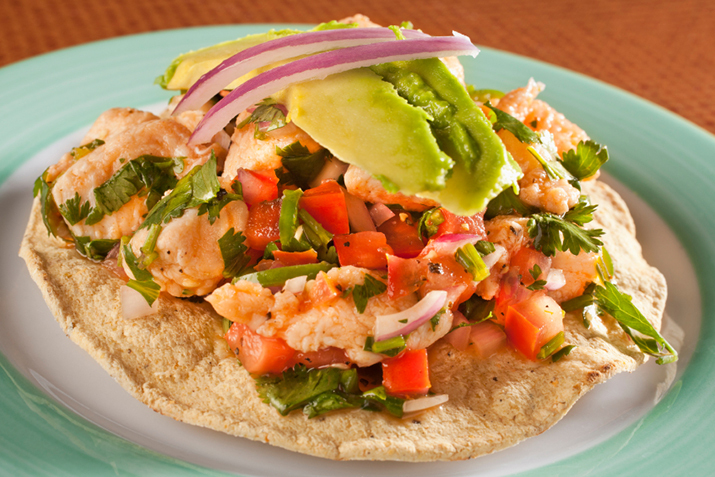 To make the tostadas: Heat a stove-top or outdoor grill to medium-high. Mix olive oil, chili powder, and salt in a large bowl. Add shrimp and toss to coat. Grill until shrimp are translucent, about 1 1/2 to 2 minutes per side. Grill tortillas, about 20 seconds per side. Spoon salsa and optional lettuce onto tortillas. Add grilled shrimp and cilantro. Delicious served with black bean and corn salad or pico de gallo. Or serve without tortillas as a shrimp cocktail appetizer. Garnish each plate with lime wedges.